In a 2007 article for Harvard Business Review, John P Kotter introduced a statistic that has been both a source of panic, and a stimulus for best practice: 70% of change management initiatives fail. PRINCE2 is capable of bucking this ongoing trend. The potential for successful change is always there. Unfortunately, so are the obstacles, such as stakeholder conflict and ill-defined goals. These 6 tips will help you fend off any resistance to your proposed change. 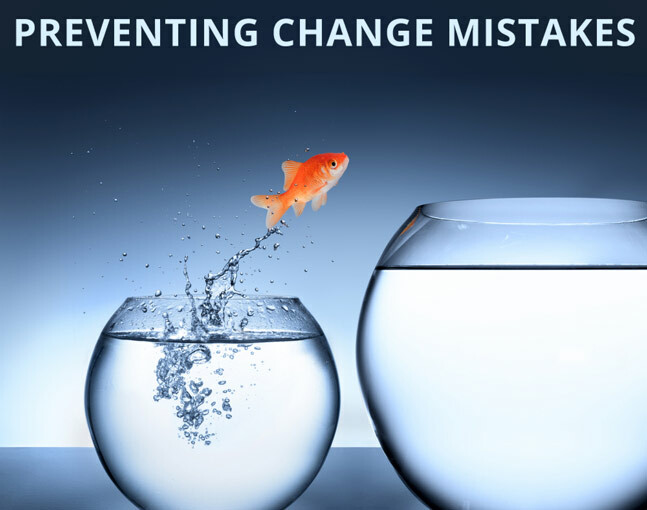 According to a February 2017 blog post from AXELOS, one of the biggest change mistakes a programme manager can make is ‘addressing change too late in the programme lifecycle.’ Successful programme managers should see an opportunity for change as early as possible. Furthermore, they must put the wheels in motion as soon as possible. This reduces opportunities for resistance to form, or for concerns to worsen. A successful change is not short-term or superficial. Instead, it must become an innate part of your company culture. People resist change when they either don’t see the point, or feel that it won’t help them in the long run. When proposing any kind of large-scale change, a good programme manager must always relate it to their organization’s long term goals. Any change-related concerns need to be assuaged with ongoing backing of company executives. This is the first of PRINCE2’s seven core principles: continued business justification. If managers and stakeholders stand their ground, the long-term benefits of change will begin to resonate. If, however, they distance themselves, any implementation measures may fall to people who aren’t truly invested in change. Stephen Warrilow argues that the root cause of change management failure is ‘lack of clarity and […] communication.’ Any hint of a hidden agenda will spark an amount of suspicion no change initiative can endure. The people skills necessary to mitigate this are fundamental to any programme manager role. This is supported by PRINCE2 and all other project management methodologies. PRINCE2 processes like ‘Controlling a Stage’ or ‘Directing a Project’ exist because initiatives need constant monitoring to reach their goals. Another change mistake outlined by AXELOS is ‘associating “change” purely with “communications.” It’s not enough to just put out a directive for change. A manager needs to confirm that stakeholders received and understood it. Most project management methodologies are adaptable, and PRINCE2 is definitely no exception. However, it’s surprising how managers interpret frameworks like PRINCE2 as a ‘one size fits all’ approach. Flexibility is what enables so many businesses to successfully implement large-scale change. So if a process or theme isn’t a perfect fit, your initiative will definitely survive without it. As a world-leading project management framework, PRINCE2 is a powerful ally in visualising, planning and implementing change. PRINCE2-certified managers operate with consistency and clarity, ensuring a controlled beginning, middle and end to any project. If you want this kind of professional success, we offer a Pass Pledge on the PRINCE2 Foundation exam! That means unsuccessful candidates can retake the exam for free within three months of their first attempt. For any queries about PRINCE2, please don’t hesitate to get in touch. Click here to access our contact page.